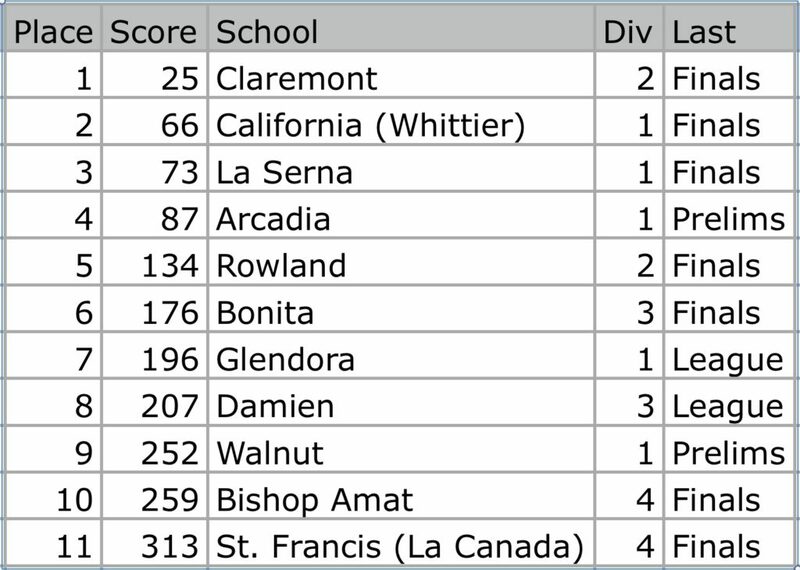 As expected, overall SGV leaders Claremont lead the boys and girls SGV Div. I Rankings. This new ranking system adjusts school enrollment according to demographic factors (explained here), and divides the 78 schools of the SGV into three divisions. These specific rankings are based on a merge of the top 11 or 12 teams in the division, using each team’s last race up through CIF finals. For teams that did not advance to prelims, times were adjusted to the equivalent at the Riverside XC course. The goal is to try to determine what would happen if these had met up in their final race. And since there are only 18 teams in SGV Div I compared to 26 in Div II and 34 in Div III two divisions, these rankings go to 7. Claremont (CIF Div. 2) – the Wolfpack defended all of their titles. 2018 saw them win their seventh straight League Championship, and third straight CIF and State crowns in the very though Div. 2. Clearly the class of our region. California (CIF Div. 1) – defended their Del Rio Championship in a rebuilding year, but were not able to advance from Prelims. They ranked 4th overall in the SGV. Bishop Amat (CIF Div. 4) – had a bit of an off day at CIF Finals, where they were 13th, ending their streak five straight State Meet appearances. They ranked 11th in the SGV. La Serna (CIF Div. 1) – ran well all year, and finishing just behind Cal at League and at CIF Finals, where they were 8th. This was the Lancers best year ever, and they were #3 overall in the SGV. Arcadia (CIF Div. 1) – while not hurt quite as much as the girls by graduation, this was also a rebuild or reload year for the Apaches. They were second in the strong Pacific League, and were 12th at CIF Finals. They ranked #5 overall in the SGV. Rowland (CIF Div. 2) – held back a bit by nagging injuries to their top runners, the Raiders defended their Valle Vista title and advanced to CIF finals for the third year straight, finishing 16th. They were #6 overall in the SGV. Bonita (CIF Div. 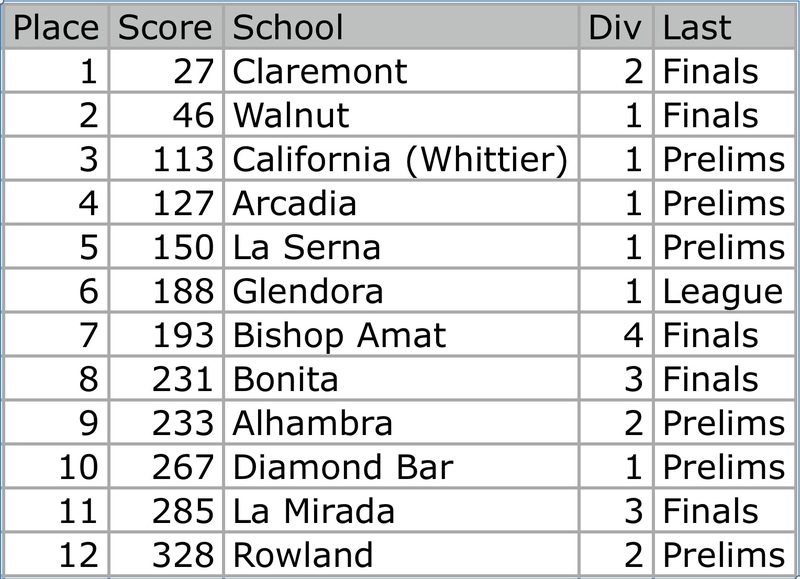 3) – were third in the really tough Palomares league alongside bigger (and demographically similar) D1 & D2 schools. They ran well at CIF Finals to finish 10th, and ranked 7th in the SGV.